I first heard about this movie thanks to its similarities with one of my favorite video games right now, “Clive Barker’s Jericho”. “CBJ” is by no means the pinnacle of gaming achievement – hell, it’s not even as creepy as his first game, “Undying” — but it’s entertaining, which is more than I can say about “The Devil’s Tomb”. It is virtually everything that’s wrong with the horror genre today: It’s boring, predictable, ridiculous, and worse still, it wastes the talents of Gooding, Ron Perlman, and Henry Rollins. The story follows a supposedly elite mercenary squad into a secret underground base in the Middle East… except the majority of the squad is dumber than a bag of hammers. Madcap horror mayhem ensues. It does, however, leave us with at least one valuable lesson. If you are a member of a crack mercenary team in a sealed bunker almost two miles underground and a hot, naked chick appears out of nowhere – DO NOT make out with her. She’s most likely an illusion created by an evil priest who will break your arm, spit black stuff into your mouth and then drag you off to your well-earned demise for being so frakkin’ stupid. The tagline for this movie was, “An evil entombed for 2000 years… until now.” It’s a pity we couldn’t have kept it buried. 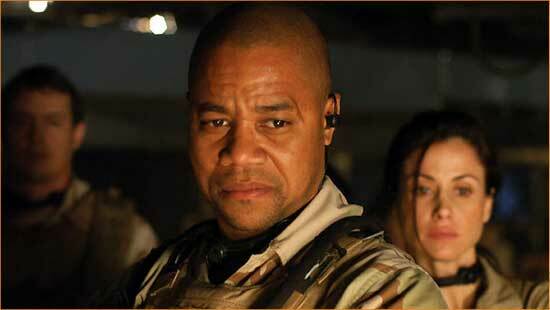 Sadly, “The Devil’s Tomb” is nothing more than another milepost on Cuba Gooding Jr.’s own road to hell.